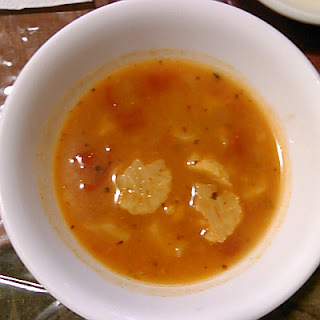 We had a few baby tomatoes left and the tag end of a head of cauliflower, so I made this soup. Put these into a blender or food processor and whirl. Cook the onion in olive oil until the onion is tender and translucent. Bring to a boil, then reduce heat to simmer. Simmer for about 15 minutes. Add the reserved cauliflower and tomato and continue to simmer for another 5 minutes or so.